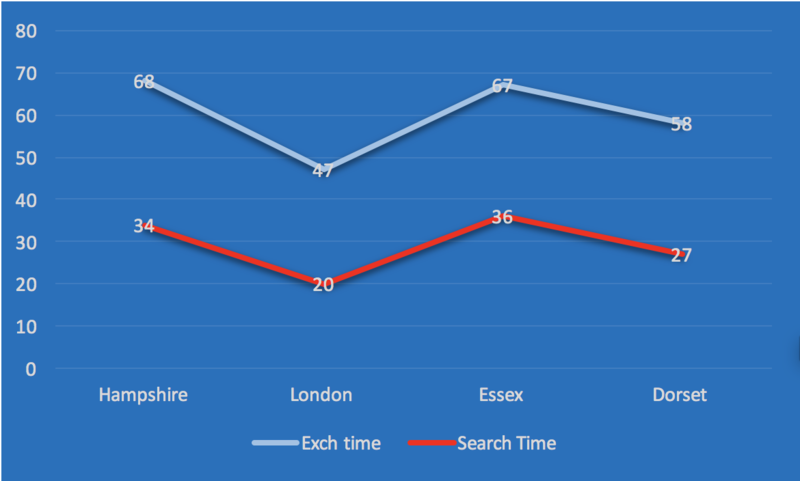 For the purpose of this article I have chosen to analyse how the time it takes receiving search results from the date of the sale being agreed effects exchange times. I have chosen four of our current clients in different counties and have used the data we have gathered over a period of two months to measure this. As you can see from the results there is a clear pattern between the receipt of the search results and exchange times so it is clear that exchanges are effected by how long these can take. Most solicitors will not raise enquiries without their search results and this is the main reason the results of the searches hold up the sale. WHAT IF? the buyer’s solicitors were armed with the searches within days of the sale being agreed? I believe that if the vendor’s solicitors were to send over searches with the initial sale pack it could shave at least 20 DAYS off a sale based on the above data. Exchange times should be something all agents should be conscious of, whether you are charging up-front fees or fees on completion, the clients experience should be your number one priority and usually exchanges times form a part of this! Ask vendor to take out searches upon bringing their property onto the market, in our experience this could shave at least 20 days from the transaction. Searches are valid for 6 months. INCLUDE paying for the searches within your agency fee? A possible instruction winner? Instruct Sales Pro to handle the sales progression – it has been statistically proven that by using Sales Pro we can shave at least two weeks off your average exchange time.